Moringa (Moringa oleifera Lam.) is a multipurpose tropical tree. It is mainly used for food and has numerous industrial, medicinal and agricultural uses, including animal feeding. Nutritious, fast-growing and drought-tolerant, this traditional plant was rediscovered in the 1990s and its cultivation has since become increasingly popular in Asia and Africa, where it is among the most economically valuable crops. It has been dubbed the "miracle tree" or "tree of life" by the media (FAO, 2014; Radovich, 2009; Orwa et al., 2009; Bosch, 2004). Moringa is a small to medium evergreen or deciduous tree that can grow to a height of 10-12 m. It has a spreading open crown, typically umbrella-shaped. The roots are deep. The bole is crooked, generally one-stemmed but sometimes forked from the base. The bark is corky and grey. The branches are fragile and drooping, with a feathery foliage. Young twigs and shoots are covered in short dense hairs, purplish or greenish white in colour. Moringa leaves are alternate, 7-60 cm long, tripinnately compound with each pinnate bearing 4-6 pairs of leaflets that are dark green, elliptical to obovate, and 1-2 cm in length. The inflorescences are 10-20 cm long, spreading panicles bearing many fragrant flowers. 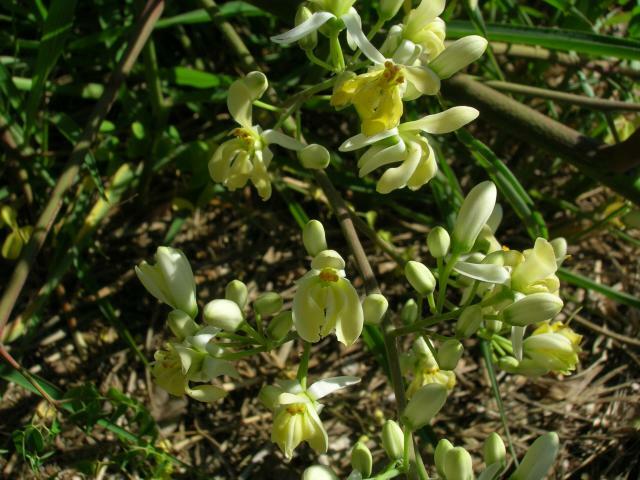 Moringa flowers are pentamerous, zygomorphic, 7-14 mm long and white to cream in colour. The fruit is a typically 3-valved capsule, 10 to 60 cm in length, often referred to as a “pod” and looking like a drumstick (hence the name "drumstick tree"). The fruit is green when young and turns brown at maturity. The mature fruit splits open along each angle to expose the seeds. The capsule contains 15-20 rounded oily seeds, 1-1.5 cm in diameter surrounded by 3 papery wings, up to 2.5 cm long. Moringa seeds contain a large amount of oil (FAO, 2014; Radovich, 2009; Orwa et al., 2009; Bosch, 2004; Foidl et al., 2001). All parts of moringa are consumed as food. The plant produces leaves during the dry season and during times of drought, and is an excellent source of green vegetable when little other food is available (FAO, 2014). Moringa is mainly grown for its leaves in Africa, and much appreciated for its pods in Asia (Bosch, 2004). Leaves, pods, roots and flowers can be cooked as vegetables. The roots have been used as a substitute for horseradish but may be slightly toxic. The leaves are very nutritious and rich in protein, vitamins A, B and C, and minerals. They are highly recommended for pregnant and nursing mothers as well as young children (FAO, 2014). They are generally cooked (boiled, pan-fried) and eaten like spinach or put in soups and sauces. Moringa leaves are also eaten as a salad or dried and ground to make a very nutritious leaf powder. Moringa leaf powder is used to aid the restoration of infants suffering from malnutrition. Moringa flowers are used to make tea, added into sauces or made into a paste and fried. The young pods are prepared, and taste like asparagus. Older pods can be added to sauces and curries in which their bitterness is appreciated (FAO, 2014; Radovich, 2009; Orwa et al., 2009; Bosch, 2004). The immature seeds can be cooked in many different ways while the mature seeds are roasted and eaten like peanuts. Moringa seeds contain about 30-40% of an edible oil (ben oil), which is used for salad dressing and cooking, and can replace olive oil. Ben oil is resistant to rancidity and provides substantial amounts of oleic acid, sterols and tocopherols (FAO, 2014; Yu et al., 2005). Moringa leaves are a valuable source of protein for ruminants but they have a moderate palatability. They are used in smallholder rabbit farming in several African countries. Using moringa leaves for feeding poultry, pigs and fish is feasible but only in limited amounts due to the presence of fibre and antinutritional factors. Moringa oil seed cake, the by-product of oil extraction, is not very palatable to livestock and mainly used as green manure or a flocculating agent in water purification. Moringa seeds appear to be toxic to rabbits. Moringa oil has various industrial applications. It is used in the perfume industry, as it readily retains its fragrance and is not prone to rancidity, and in the manufacture of paints and lubricants (Bosch, 2004; Foidl et al., 2001). Moringa oil has qualities needed for a biodiesel feedstock (Rashid et al., 2008). At the time of writing (December 2014), several projects to produce biodiesel from moringa seeds were under way in Asia and Africa. The oil cake resulting from seed oil extraction contains about 1% of floculant proteins that bind mineral particles and organic material in the purification of drinking water. They are a natural alternative to the toxic alumine generally used for treating water (see Environmental impact below). These proteins are also used to assist the sedimentation of fibres in the juice and beer industries. 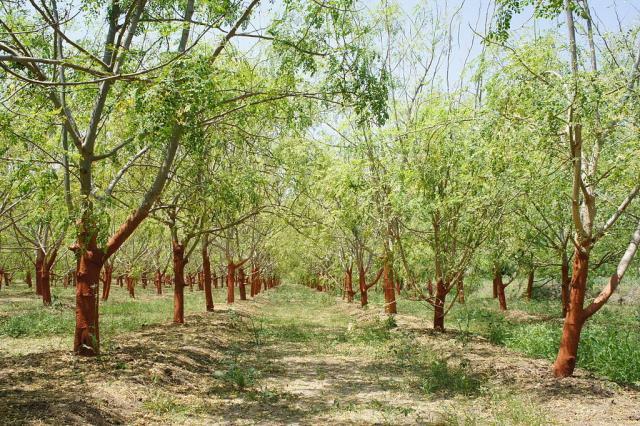 Moringa timber is soft and can only be used for light constructions, but it can produce fibre for ropes and mats as well as pulp for the paper industry. Moringa bark is a source of dye (Bosch, 2004; Foidl et al., 2001). Phytohormones extracted from moringa leaves have been shown to have a growth enhancing effect on various plants, including black gram, peanut, soybean, sugarcane and coffee. Spraying moringa leaf extract on leaves increased plant production by 20-35% (Foidl et al., 2001). Moringa seeds contain pterygospermin, a potent antibiotic and fungicide effective against Staphylococcus aureus and Pseudomonas aeruginosa. In the Philippines, due to their high iron content, moringa leaves are used in the treatment of aenemia. Moringa roots and bark are used in cardiac and circulatory problems (Orwa et al., 2009). Uses in ethnomedicine are numerous and beyond the scope of this datasheet. Moringa originated from the southern hills of the Himalayas and was introduced in many tropical and subtropical areas, largely by migrant Asian populations (Radovich, 2009; Bosch, 2004). Moringa seed oil was valued in perfume manufacture in Ancient Egypt, Ancient Greece, and the Roman Empire (Orwa et al., 2009; Bosch, 2004). Moringa is now naturalized in most African countries, in the Caribbean Islands and in Central America. Moringa is an important crop in India, Ethiopia, the Philippines and the Sudan (FAO, 2014). Moringa grows from sea level up to an altitude of 600 m, but it can be found up to 1000 m in the Himalayas, up to 1350 m in East Africa, and as high as 2000 m in Zimbabwe (Radovich, 2009; Bosch, 2004). Moringa does well where average temperatures are high, ranging from 25 to 30°C. Low temperatures and frost can kill the plant back to ground level but regrowth occurs quickly once the temperatures increase. Moringa grows better where annual rainfall is about 1000-2000 mm. However, it is tolerant of drought and survives where rainfall is as low as 400 mm, though foliage production under such conditions is reduced. Moringa has a low tolerance of waterlogging. It thrives in full sunlight. Moringa does well on a wide range of soils, with pH ranging from 4.5 to 9, provided they are well-drained (Radovich, 2009; Bosch, 2004). Moringa has some salt tolerance (up to 3 dS/m during germination and 8 dS/m once well established) (Nouman et al., 2014; Oliveira et al., 2009). India is the main exporter of moringa: canned leaves, fresh fruits (1.2 million t in India), oil and leaf powder (Radovich, 2009). In Africa, leaves are the main product for local trade (Bosch, 2004). Moringa can be grown in pure stands, or in mixtures with many other tree species such as leucaena (Leucaena leucocephala) and guacima (Guazuma ulmifolia), with vegetables species in alley cropping, or with grasses or cereal crops (New Forests Project, 2012; Petit Aldana et al., 2010). Moringa is propagated from seeds or from cuttings. When it is grown from seeds it can be sown either directly or in containers. Moringa should be sown at the beginning of the rainy season on an elevated seedbed so that it is protected from waterlogging, but it can benefit from soil moisture. While propagation through seeds is well adapted to foliage production, propagation from cuttings is suitable for high-grade fruit production and for root production (Radovich, 2009; Orwa et al., 2009; Bosch, 2004). The recommended spacing between moringa plants depends on their final use and geographic location. Leaf production increases with sowing or planting density (Goss, 2012; Foidl et al., 2001). Spacings as small as 5 x 10 cm to 20 x 20 cm were successfully used for leaf production in home-gardening conditions (Gadzirayi et al., 2014a; Radovich, 2009; Amaglo et al., 2007). Increasing the spacing (75 cm x 100 cm) is recommended when moringa is sown on larger areas, thereby reducing the number of seeds required when cost is an important factor (Radovich, 2009; Patricio et al., 2012). However, in Nicaragua, intensive production on large fields yielded up to 44 t/ha of DM at the first cutting (Foidl et al., 2001). When moringa is cultivated for pod production, 2.5 x 2.5 m spacing is recommended (Radovich, 2009). This level of spacing is also suitable when moringa is intercropped with another plant species. Moringa has an outstanding growth rate and can be harvested for foliage in less than 2.5 months. Optimal cutting intervals range from 15 to 75 days, depending on local conditions (Sultana et al., 2014; Nouman et al., 2014; Amaglo et al., 2007; Reyes Sanchez et al., 2006; Foidl et al., 2001). Fodder yields are very variable and may range from 27 to 120 t/ha of fresh matter at the first cutting (Amaglo et al., 2007; Reyes Sanchez et al., 2006; Foidl et al., 2001). Up to 9 cuttings/year can be achieved (Radovich, 2009; Bosch, 2004; Foidl et al., 2001). Highest growth and forage yield are obtained under warm, dry conditions, with some supplementary fertilizer and irrigation (Radovich, 2009). Plant management is important for leaf production. Pollarding and coppicing promote leafy regrowth and enhance leaf yield (Orwa et al., 2009). 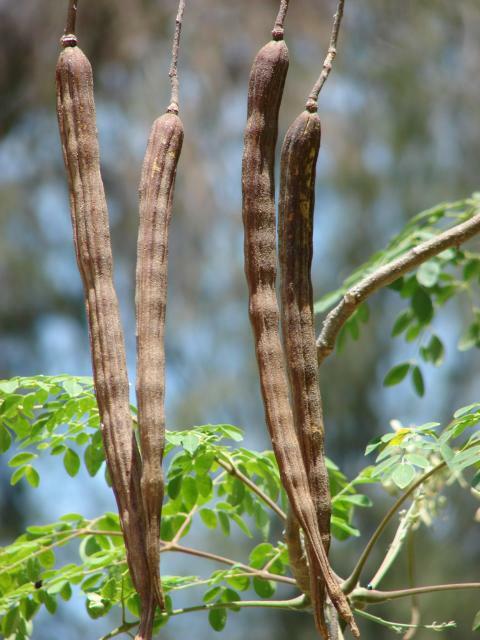 Moringa trees grown for pod production can be harvested 7 months after planting. Pod yields are about 19 kg pods/tree/year, equivalent to 30 t pods/ha/year (Radovich, 2009). In Tanzania, seed yield was reported to be about 3.3 kg/tree/year (Bosch, 2004), which corresponds to 1 to 1.5 t/ha of oil (Sengupta et al., 1970). Moringa seed powder has antibacterial properties that make it useful as a natural clarifier for water purification systems and fish ponds (Aruna et al., 2012). It is considered as a potential natural and inexpensive alternative to toxic alum, but further investigation is required since moringa seed powder may have negative effects when combined with chlorine treatment. It was found to promote bacteria regrowth after the first removal of the bacteria (Egbuikwem et al., 2013; Preston et al., 2010). Moringa seed powder can be toxic to animals and particularly to fish. This toxicity may be used in pond management to control predators of cultured fish. The median lethal concentration (LC50) of moringa seed powder in common carp was 124.0 mg/L after 96 h and the sublethal concentration was 12.4 mg/L. Common carp exposed for 35 days at the latter concentration had significant changes in all their blood parameters (Kavitha et al., 2012). Moringa leaves are usually considered as a source of protein. However, the protein content ranges from 15% to more than 30% DM as it depends on the stage of maturity and on the proportions of leaflets, petioles and stems, the latter being much poorer in protein. Likewise, the fibre content of moringa leaves reported in the literature is extremely variable, with an ADF content ranging from 8% to more than 30% DM. The lignin content is also variable, from 2% to more than 10% DM. Moringa leaves contain high levels of minerals (about 10% DM), particularly Ca and Fe. They are also rich in a wide range of vitamins (ß-caroten, ascorbic acid, vitamin B1, B6 and niacin) (Price, 2007; Reyes Sanchez, 2004) as well as flavonoids (quercetin and kaempferol), which are known to be more potent antioxidants than ascorbic acid (Yang et al., 2006; Siddhuraju et al., 2003). Moringa leaves may thus be used as an antioxidant feed (Makkar et al., 2007). They have a relatively high concentration of lipids (5-6%, up to 10% DM) with an important proportion (33 to 45%) of α-linolenic acid (C18:3n-3) (Moyo et al., 2011; Olaofe et al., 2013). Moringa seed cake defatted with a solvent is a high-protein ingredient containing about 60% DM of protein, with limited amounts of fibre (NDF 9% DM) and fat (less than 1%). Its amino acid profile is rich in sulphur-containing amino acids (methionine + cystine: 6.1% of protein) but very poor in lysine (less than 1.5% of protein). Moringa leaves have been found free of trypsin inhibitors. Saponin content was relatively high (up to 8%). Moringa leaves and twigs contained limited amounts of cyanogenic glucosides (Makkar et al., 1997). The latter study did not detect glucosinolates in the leaves and only trace amounts in leaves and stems, but later trials using a different method of analysis reported significant amounts of glucosinolates (Bennett et al., 2003; Amaglo et al., 2007; Bellostas et al., 2010). Condensed tannins are either absent (Makkar et al., 1997) or present in small amounts (Bakhashwain et al., 2010; Moyo et al., 2011). Ethanol-extracted leaf meals were not reported to contain antinutritional factors (Afuang et al., 2003). Moringa seeds contain important amounts of glucosinolates (Bennett et al., 2003). Moringa seed cake was also found to contain significant amounts of glucosinolates and phytate (65.5 µmol/g and 4.1% respectively) as well as saponins, but in a lesser concentration (1.4%) than in the vegetative fractions. Some haemagglutination activity was detected in the meal (Makkar et al., 1997). Moringa leaves are a good source of digestible protein, digestible OM and energy for ruminants and, therefore, a valuable protein supplement. In addition, they are a valuable mineral supplementation when minerals are limited or unavailable. The palatability of moringa forage has been reported to be only average. Moringa leaves could successfully supplement low-quality forage diets and improve animal performance. However, when included in ruminants diets to replace concentrates (commercial, sunflower meal, soybean meal), animal performance tended to be reduced. Moringa leaves are typically fed fresh to ruminants. However, they have been ensiled alone, or in mixtures with Napier grass or sugarcane, to increase the nutritive value of the silage (Mendieta-Araica et al., 2009). The palatability of moringa is average. 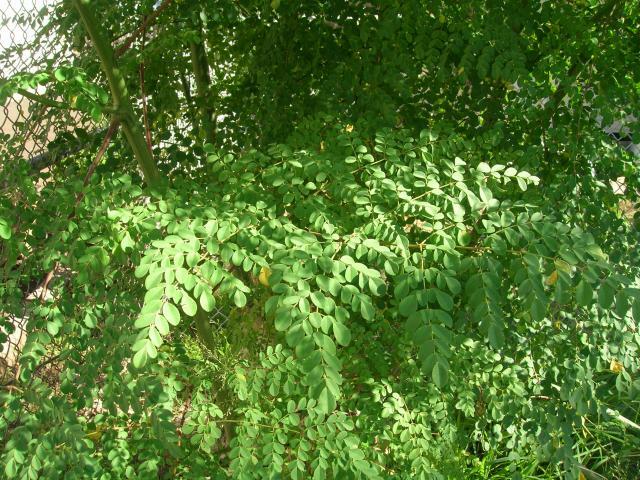 Compared to several shrub and tree species in Cuba and Venezuela, moringa leaves were only moderately consumed by cattle, sheep and goats (Garcia et al., 2008c; Garcia et al., 2008d; Toral Perez et al., 2008). However, when used as sole supplement or included into a concentrate in diets for growing goats, the DMI of Moringa oleifera leaves was comparable or higher to that of leucaena (Leucaena leucocephala) or gliricidia (Gliricidia sepium) (Ndemanisho et al., 2007; Asaolu et al., 2012). 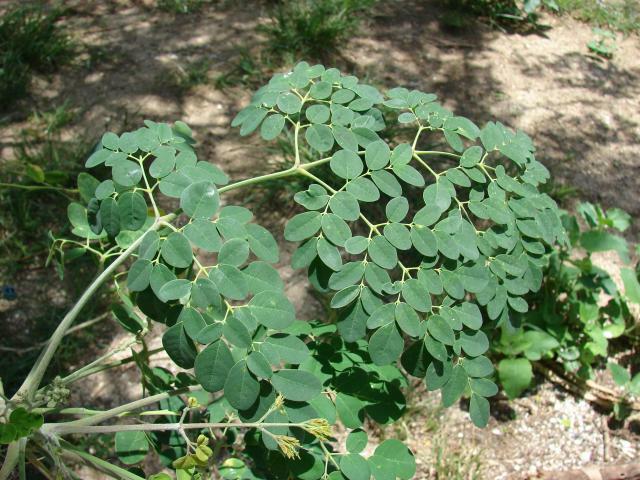 Moringa leaves are a valuable source of protein for ruminants. Its protein and organic matter are readily digestible in the rumen and/or in the intestine (Makkar et al., 1997; Makkar et al., 1996; Kakengi et al., 2005; Ndemanisho et al., 2007; Gutierrez et al., 2012). However, the available data are highly variable, and reported in vitro and in vivo OM digestibilities range from 40 to 80%, possibly due to the large variability in fibre content. Moringa leaves and stems contain low amounts of tannins with no or low amounts of condensed tannins (Bakhashwain et al., 2010; Murro et al., 2003; Sarwatt et al., 2002; Aregheore, 2002; Makkar et al., 1997; Makkar et al., 1996). The levels of glucosinolates found in moringa leaves were not reported to impair ruminant nutrition (Bennett et al., 2003; Amaglo et al., 2010). However, they contain saponins, which may impair palatability. Moringa leaves seem to promote rumen microbial protein synthesis due to the substantial contents of readily fermentable nitrogen and energy (Soliva et al., 2005). Rumen in sacco DM degradability of the leaves ranging from 82 to 95.6% have been reported (Garcia et al., 2008d; Ndemanisho et al., 2007; Sarwatt et al., 2004). However, lower values (less than 70%) were observed in different animal species and different pore size of the nylon bags (Gutierrez et al., 2012; Garcia et al., 2008a). In Nigeria, including moringa leaf meal in ruminant diets reduced their metabolizable energy content, OM digestibility and production of short chain fatty acids (Tona et al., 2013). Moringa leaves have been assessed as a protein supplement for medium or low producing dairy cows fed low-quality forages. Feeding moringa leaves had variable effects on DM intake and milk yield but did not change milk composition. 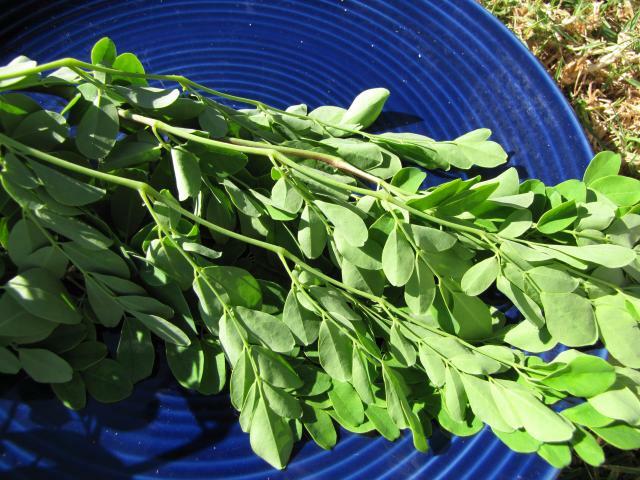 Moringa leaves offered as the sole forage (fresh or ensiled) plus molasses gave the same results as a low quality forage supplemented with concentrate. Fresh moringa leaves used as the sole forage fed to dairy cows negatively modified the smell and taste of milk and cheese, which could have been due to the presence of glucosinolates in the leaves. Milk from cows fed ensiled moringa leaves did not have off-flavour and aroma, possibly because the ensiling process destroyed most of the glucosinolates, as observed with other forages (Mendieta-Araica et al., 2011a). In growing steers, moringa leaves used as the sole concentrate and fed at 0.59% BW resulted in a gain of 380 g/d (Reyes Sanchez et al., 2006). When moringa leaves replaced a commercial concentrate in growing steers (pure N’Dama or N’Dama x Jersey crossbred) fed groundnut hay, they depressed DM intake, but increased the daily weight gain of both breeds: 625 vs. 458 g/d (N’Dama) and 750 vs. 625 g/d (crossbred), respectively (Nouala et al., 2009). Moringa leaves totally replaced cottonseed cake for growing lambs fed on low-quality hay. Hay intake (355 vs. 324 g DM), DM digestibility (70 vs. 60 %) and daily weight gain (62 vs. 52 g/d) were all increased (Murro et al., 2003). Feeding growing goats with moringa leaves as the sole forage, or combined with other legume tree leaves in the diet, had no effect on total DM intake (278-289 g/d) and diet digestibility (76-77%) (Asaolu et al., 2011). Moringa leaves included at up to 50% as the sole supplement in diets based on low quality forage increased daily weight gain and diet digestibility (Aregheore, 2002). Moringa leaves offered to growing goats fed low-quality forage or cassava peels to replace cottonseed cake, sunflower seed cake or a commercial concentrate (250 g/d) had no effect on daily weight gain (Ndemanisho et al., 2007; Sarwatt et al., 2002; Asaolu et al., 2012). Moringa leaves replaced a commercial concentrate (250 g/d) in a diet based on cassava peels without modifying daily gain (21 g/d), which was higher than with other legume tree leaves (Asaolu et al., 2012). Supplementing growing goats fed on grass hay and wheat bran with moringa leaf meal, instead of sunflower cake, resulted in higher meat quality (physical and chemical characteristics together with organoleptic quality parameters, including higher first bite, aroma, flavour and juiciness scores) (Moyo et al., 2014). In vitro assessment by the gas production method has shown that moringa seed cake may be a better source of digestible protein than moringa leaves (Kakengi et al., 2005). In Barbarine male lambs (4 months, 26 kg), increasing the amount of defatted moringa seed meal (0, 2, 4 or 6 g/d) in a diet based on oat vetch hay and soybean meal (100 g/d) did not change hay DMI (~ 1kg) or DM digestibility (658%). Daily gain was higher with 4 g/d of defatted moringa seed meal compared to the control diet (97 vs. 64 g/d) (Ben Salem et al., 2009). Extracts of moringa leaves obtained with aqueous maceration had in vitro anthelmintic properties on gastrointestinal strongyles common in sheep. A dose of 50 mg/mL of extract reduced egg hatching by 43 to 52% in strongyles and caused 86-90% mortality of larvae. Larvae migration was reduced by 97% at dose rates from 12.5 to 50 mg/mL (Puerto Abreu et al., 2014). Similar results were observed on the parasitic nematode Haemonchus contortus in goats, where a moringa leaves extract, obtained by infusion and included at 5 mg/ml, reduced hatching by 90-98% and resulted in 51-70% mortality of larvae (Tayo et al., 2014). Information about the nutritive value of moringa leaves and seed cake in pig feeding is scarce. In vitro estimations showed that moringa leaves could be valuable in pig feeding and may have a good energy value, though they do not completely meet the pig’s nutritional requirements (Kambashi et al., 2014). Feeding trials with moringa leaf meal have been only partly successful as high inclusion rates were found detrimental to performance. In Nicaragua, including up to 30% moringa leaf meal in diets for growing pig as part substitution for a commercial concentrate decreased pig performance and depressed feed conversion ratio but, depending on feed costs it could have been an economic option (Perez et al., 2001). In the Philippines, moringa leaf meal included at 10%, partially replacing a commercial concentrate for ‘backyard’ growing pigs, did not hamper performance (Acda et al., 2010). There has been a lot of research on the potential of moringa leaf meal (dried and ground moringa leaves) as an alternative feed ingredient for poultry, due to the rising interest in moringa and because the leaves have a high protein content. However, the digestibility of diets containing moringa leaf meal was found to be lower than that of control diets, especially for crude protein (and therefore amino acids), which was partly due to the fibre content, which also limits its energy value in poultry (Abou-Elezz et al., 2012b). While some literature reviews have been quite optimistic (Moreki et al., 2014; Gadzirayi et al., 2014b), most studies show that the use of moringa leaf meal in broiler diets results in decreased performance. Inclusion rates as low as 5-7.5% have reduced growth by 15% (Zanu et al., 2012; Olugbemi et al., 2010a; Oludoyi et al., 2012; Gakuya et al., 2014). Feed intake is generally not much affected, which leads to a reduction in feed efficiency.The depression in growth is linked by some to unbalanced diets, in other cases it appears to be a direct effect of moringa. However, this detrimental effect of moringa is not constant and in some trials performance was similar to (but seldom higher than) those obtained with control diets, even with 7.5 to 10% moringa leaf meal (Onu et al., 2011; Foluke et al., 2013; El Tazi, 2014; Banjo, 2012). However, performance always deteriorates when moringal leaf meal is included at 20% or more in the diet (Tesfaye et al., 2013; Jiya et al., 2014; Gakuya et al., 2014). The general recommendation is to avoid the use of moringa leaf meal in intensive broiler production, as the risk of a loss in performance is high. Very low levels (less than 2%) need testing for potential probiotic effects. In slow-growing chickens, up to 10% moringa leaf meal maintained growth performance in some studies, but it decreased at higher levels (Melesse et al., 2011; Gadzirayi et al., 2012; Chongwe, 2011). Other studies observed reduced growth with as little as 5% moringa in the diet (Gadzirayi et al., 2014a). A cost-benefit analysis is required on a per case basis, as including moringa leaf meal may reduce the need to purchase high priced ingredients. In layers, moringa leaf meal generally lowers laying performance and feed efficiency at high inclusion rates (15-20%) (Kakengi et al., 2007) but also sometimes at lower (5 to 7.5%) levels (Ebenebe et al., 2013; Olugbemi et al., 2010b). However, there are some reports of performance being maintained at a 10% inclusion rate (Kakengi et al., 2007), and improved at 2.5% (Ebenebe et al., 2013). In moderately productive layers, fresh moringa leaves added to ad libitum commercial feed improved laying performance but results were negative when the quantity of commercial feed was reduced (Abou-Elezz et al., 2012a). The recommendation is to use moringa leaf meal carefully in layer feeds, and at no more than 5% of the diet. Moringa leaf meal and moringa leaf extracts, because of their active compounds, have been tested in poultry as feed additives for their potential benefits on poultry health and meat or egg quality. However, there can be negative affects on digestion and metabolic processes. Some results showed a positive effect of moringa extracts and, at low levels (below 2%), moringa leaf meal (Portugaliza et al., 2012; David et al., 2012; Teteh et al., 2013). No major toxicity problems have been reported (Ashong et al., 2011). The effect of moringa on serum and egg cholesterol levels is disputed, as some studies report a decrease in cholesterol (e.g. Ashong et al., 2011) and others an increase (e.g. Gakuya et al., 2014). As a consequence, moringa leaf meal cannot be used reliably to regulate cholesterol levels in poultry products. Fresh leaves of Moringa oleifera tend to be rich in protein with a moderate content of fibre. In Benin and Ghana, they are used by smallholder rabbit farmers as a traditional nutritive forage, which is particularly valuable in the dry season when other forages are not available (Adoukonou, 2014, personal communication; Osei et al., 2012). In Nigeria, moringa leaves are used in rabbit research as a standard forage fed with concentrates (Ola et al., 2013). Fresh moringa leaves given to breeding rabbit does at 2% of body weight with a concentrate were found as efficient as fresh Centrosema pubescens (control) and Tephrosia candida (Odeyinka et al., 2008; Ola et al., 2012). Fresh moringa leaves offered ad libitum, with a concentrate, to growing rabbits were slightly less palatable (17% of daily intake) than Leucaena leucocephala and Brosimum alicastrum foliages (22 and 27% of daily intake respectively) (Safwat et al., 2014a). Because rabbits consume both the leaves and the tender stems (Osei et al., 2012), they can be used efficiently for the routine pruning recommended to maximise forage production from moringa trees (Palada et al., 2003). Since the late 2000s, many trials have assessed the nutritive value of moringa leaf meal, for growing rabbits, as a potential replacement for soybean meal (Nuhu, 2010; Ewuola et al., 2012a; Odetola et al., 2012; Owen et al., 2013), groundnut cake (Adeniji et al., 2012; Alemede et al., 2014), wheat offal (Vantsawa et al., 2014), or maize bran plus soybean meal (Abu et al., 2013). Inclusion rates in such diets ranged between 10 and 15%. These trials generally concluded that moringa leaf meal can be used safely in rabbit feeding, with no reduction in growth rate, feed efficiency, slaughter yield or blood parameters. However, moringa leaf meal has been linked to a slight but significant reduction of serum glucose and serum cholesterol concentration (Rajeshwari et al., 2008; Ewuola et al., 2012b). In some trials, moringa leaf meal was included successfully at 30% (Dahouda et al., 2013), and up to 40% of the diet (Safwat et al., 2014b). The main limit to the use of moringa leaf meal for feeding growing rabbits is the required nutritional balance of the diets rather than the product itself. 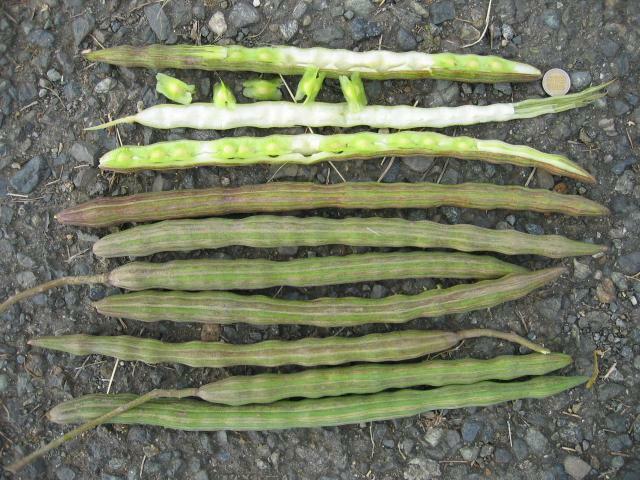 In breeding rabbits, moringa leaf meal was fed to males at 15% (Abu et al., 2013), and to breeding does at 7.2% in substitution for soybean meal (Ayodele et al., 2014). When moringa leaf meal replaced 20% of soybean meal protein, the breeding performance of rabbit does was significantly better than that allowed by the control diet (Ayodele et al., 2014). While moringa leaf meal is an efficient source of dietary protein, it is deficient in sulphur-containing amino acids (providing only 50 to 80% of requirements) and lysine. In experiments with protein-rich moringa leaf meal, the faecal protein digestibility was found to be high (70-71%, Adeniji et al., 2012) or increased in presence of moringa, e.g. from 65% up to 80% (Ewuola et al., 2012a; Nuhu, 2010). This positive effect of moringa leaf meal on protein and DM digestibility was also observed at moderate inclusion rates as low as 3% (Djakalia et al., 2011). However, when moringa leaf meal contained less protein (20-23%) and more fibre (NDF 31%, ADF 26%, Safwat et al., 2014b), the calculated protein digestibility was only about 50% (Lebas, 2013). Likewise, the digestible energy content of moringa leaf meal may be estimated from 10.6 to 13.8 MJ/kg DM for low-protein and high-protein meals respectively (Lebas, 2013). Therefore, it is recommended that the composition and nutritional value of moringa leaf meal is assessed on a per case basis before it is used in balanced rabbit diets. The relatively high energy content of moringa leaf meal is partly due to its low fibre content but also to its unusually high concentration of lipids. The high proportion of α-linolenic acid may help to improve meat composition as well as the health status of rabbits (Colin et al., 2012). Moringa leaves and their extracts may have an immunomodulating effect. Aqueous extracts of moringa leaves fed for 30 days to male rabbits (5 ml/d/head) increased CD4 cells, blood insulin concentration and enhanced enzymatic activity (Isitua et al., 2013). Inclusion of moringa leaves in the diets of growing rabbits had an antihyperglycemic or hypoglycemic effect and an hypocholesterolemic activity (Rajeshwari et al., 2008). Literature on the use of moringa seeds in rabbit feeding is nonexistent at the time of writing (December 2014). In Benin, growing rabbits fed a compound diet containing 10% moringa seeds had a 50% mortality rate within the first 10 days. It is not known whether this was due to an intrinsic toxicity of moringa seeds, which contain glucosinolates, or to a post-harvest contamination, as the seeds had been stored for several months before use (Adoukonou, 2014, personal communication). In support of the toxicity hypothesis, it should be noted that moringa seeds fed to growing rats resulted in low feed intakes, impaired growth and physiological troubles (Oliveira et al., 1999). 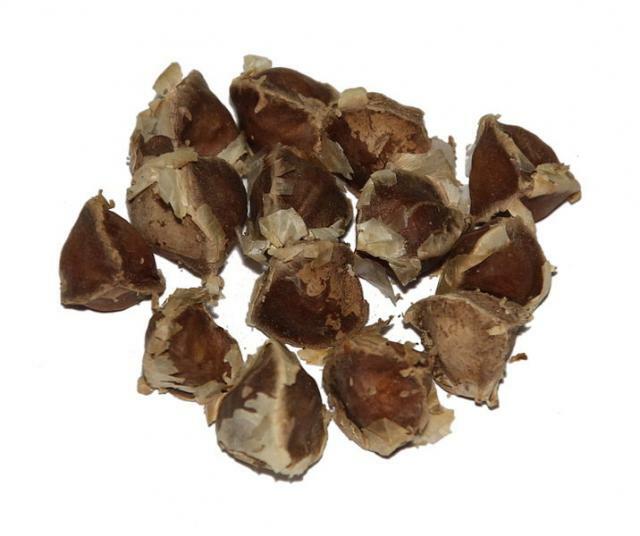 Therefore, the use of moringa seeds in rabbits feeding cannot be recommended until trials demonstrate its safety. Moringa leaf meal is rich in protein and has been tested in various fish species as a potential replacement for fish meal. However, feeding trials show that only limited amounts of moringa leaf meal can be safely used in fish diets, which is probably due to the presence of phenolics, saponins, phytic acid and other metabolites with antinutritional effects in fish (Richter et al., 2003; Egwuy et al., 2013). Moringa leaf meal can be included in Nile tilapia diets in limited amounts only, up to 8-10% of the diet (Abo-State et al., 2014; Yuangsoi et al., 2011; Richter et al., 2003; Afuang et al., 2003). In a diet where moringa leaves were included at 10% to provide supplementary protein, protein digestibility was reported to range from 68% to 75%, and daily weight gain was increased by 30% (Yuangsoi et al., 2011). Inclusion levels higher than 10% resulted in lower specific growth rate, lower nutrient utilization and poorer carcass composition (Abo-State et al., 2014). Including moringa leaf meal at 12% (as fed, replacing 15% of soybean protein) significantly reduced DM digestibility, and a 24% inclusion rate reduced all nutrient digestibilities (Kasiga et al., 2014). Methanol-extracted leaf meal containing less saponins and phenolics was included at up to 30% in the diets for tilapia fingerlings without hindering fish performance, but carcass protein was reduced (Afuang et al., 2003). Water-extracted leaf meal included at 15% of the diet had deleterious effects on feed intake, feed utilization and fish performance. The product was still highly unpalatable to fish, who spat out the feed pellets (Madalla, 2008). Different moringa leaf extracts (tannin-reduced, saponin-reduced and saponin-enriched) were all shown to reduce fish performance (Dongmeza et al., 2006). Moringa leaf meal replaced up to 25% of fish meal in the diets of redbreast tilapia (Coptodon rendalli) without compromising fish growth, but resulted in hepatocyte degradation and enterocyte irritation, and increased feed costs (Hlophe et al., 2014). Moringa leaf meal included at 12.5% of the diet for African catfish fingerlings replaced groundnut cake without hampering fish performance (Olaniyi et al., 2013). Up to 20% moringa leaf meal inclusion did not affect fish performance, feed conversion ratio and protein efficiency, but higher rates increased serum enzymes, which suggested some cellular damage (Ozovehe, 2013). Moringa seed cake replaced 50% of soybean meal (8.5% of the diet) in basa fish diets based on fish meal and soybean meal. Higher rates resulted in poorer fish performance, a reduced feed conversion ratio and lower protein efficiency. No signs of pathology were observed at any inclusion level (Yuangsoi et al., 2014). In carp, moringa leaf meal was included at 8.8% of the diet, replacing 20% of the soybean meal protein without compromising protein digestibility, fish growth and feed conversion ratio, and with no deleterious effects on fish health (Yuangsoi et al., 2012). Moringa seeds and bark contain several chemical substances that are potentially useful for pond management. Moringa seeds contain oleanic acid and ursolic acid, which are known to have antifertility properties. They can be used to control early undesirable fish reproduction in fish ponds (Ampofo-Yeboah et al., 2013). Moringa root bark extracts contain ichthyotoxic substances that can be used to manage predator populations in an environment-friendly manner in fish ponds prior to stocking desirable fish species (Adesina et al., 2011; Adesina et al., 2013b). Moringa seed powder contains a natural floculating agent that can replace toxic alum to remove organic matter from pond water. However, it has been shown to result in pathologic lesions in Nile tilapia (Oreochromis niloticus) (Ayotunde et al., 2011). Broin, M., 2005. Nutritional composition of Moriga oleifera leaves. Moringa news, 5pp. Nuhu, F., 2010. Effect of moringa leaf meal (MOLM) on nutrient digestibility, growth, carcass and blood indices of weaner rabbits. In: MSc. Thesis. Anim. Nutr., Kwame Nkrumah University, Kumasi (Ghana), 122 pp. Reyes Sanchez, N., 2004. Marango: Cultivation and utilization in animal feeding. Guia tecnica n°5, Universidad Nacional Agraria, Por un desarollo agrario integral y sostenible, 24 p.